Jessa O'Connor talks primary elections with "All Things Considered" host Mark Rumsey. Primaries are gearing up in North Carolina and the voter registration deadline is fast approaching. Here's what voters in Mecklenburg County need to know in preparation for the elections. 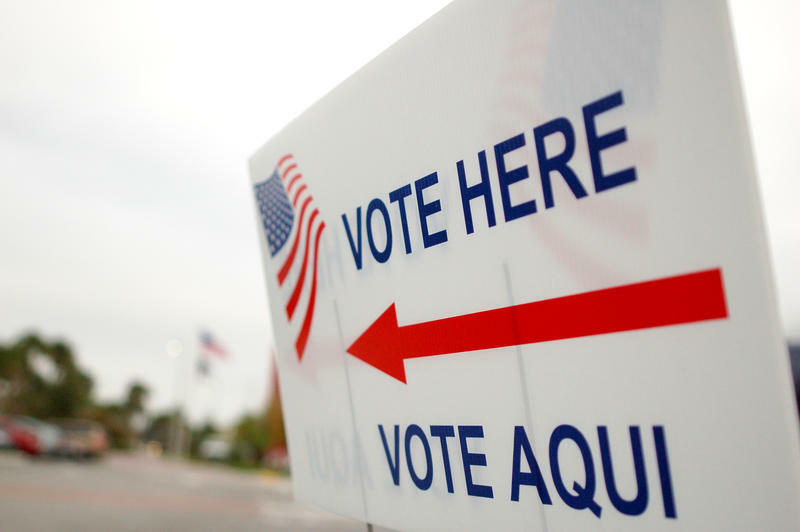 When is North Carolina's primary election? The North Carolina primary will take place on May 8, 2018. North Carolina has a semi-open primary, meaning voters who are registered with a particular political party can only vote for candidates within their party. Unaffiliated voters can vote for candidates in any political party. How do I know if I’m registered to vote in the primary? The deadline to register to vote in the North Carolina primary is Friday, April 13, 2018. If you’re not registered to vote, fill out this form and mail it to your county board of elections. Look up your polling location by entering your address here. Key Issues: Two issues rise to importance in this race – video visitation for inmates and the 287(g) program. During his tenure as Sheriff, Carmichael has implemented video visitation for inmates - a service that visitors pay to use if they utilize more than once per week. Carmichael said the new technology expands possible visitation hours and makes visiting inmates more convenient. Ensley, a former CMPD officer calls it a “profiteering system.” McFadden, a former CMPD detective, supports the program as long as it is paired with in-person visitation. Carmichael has also supported the county's continued participation in the 287(g) program, an agreement with the U.S. Immigration and Customs Enforcement, that calls for the Sheriff’s office to checks the immigration status of anyone it arrests and then notify ICE if there is someone believed to have entered the country illegally. Both Ensley and McFadden oppose the program. McFadden said it damages law enforcement’s relationship with the community because it keeps witnesses from wanting to step forward. Ensley said he would “dismantle” the program. Why these races are important: The Board of County Commissioners control funding for county programs and services. A change in leadership could impact how funds are distributed to different county entities. A few issues are driving this race: bringing economic mobility and creating opportunities. Other important issues include funding for Charlotte-Mecklenburg Schools, especially in terms of school security, and the operation and oversight of the Mecklenburg County Health Department. Why these races are important: As it stands now, there is a Republican super majority in the General Assembly. This means that Republicans have a large enough number of representatives in the legislature that they can override Democratic Gov. Roy Cooper if he vetoes their legislation. Democrats hope to win four House seats and six Senate seats in the general election to break the super majority. North Carolina House of Representatives: Click for the district map. Key Issue: Incumbent Rodney Moore has been under recent scrutiny following an ongoing state investigation into his failure to report campaign contributions from political action committees – an issue that challenger Jackson Pethal has been quick to point out. According to the Charlotte Observer, there are at least 19 unreported contributions totaling more than $10,000. Ford told the Observer that he’s “just a bad bookkeeper,” but that he’s working with his treasurer to “clear it up.” Ford has also refused to turn over financial records despite multiple requests from the state, according to election officials. North Carolina Senate: Click here for the district map. Key Issue: In the Democratic primary, incumbent Joel Ford is being criticized by challenger Mujtaba Mohammed for being too moderate, especially in a state where Republicans have a super majority – holding 35 out of 50 Senate seats. Mohammed told the Charlotte Observer that the Democratic candidate for the general election must provide people with a “bold progressive vision,” one that he believes Ford does not represent. Key Issue: In the Republican primary, incumbent Dan Bishop is being criticized by challenger Beth Monaghan for being one of the main sponsors of House Bill 2, or the so-called “bathroom bill.” Mohaghan said Bishop “abandoned Republican values” by sponsoring a bill she said tarnished North Carolina’s reputation. U.S. Congressional races to watch: Click here for the district map. District 8: From Concord to north of Fayetteville. District 9: From south Charlotte to southeast of Fayetteville. Key Issues: Although District 9 is majority Democratic (based on data listed on the state board of elections website), the district has been held by Republicans since 1963. Republican incumbent Robert Pittenger faces Mark Harris, who he barely edged in the 2016 election, and Clarence Goins Jr. in the primary. District 9 is one Democrats are hoping to flip in the general election. Pittenger could face a well-financed Democrat, Dan McCready, should both win the primary election. Data shows McCready raised over $1.2 million, compared to Pittenger’s $780,000, making him the best-financed candidate entering the primary. McCready also raised more than three times what his Democratic challenger, Christian Cano, raised. District 10: From Gastonia to Asheville. District 11: From Morganton to west of Asheville. Libertarian: Clifton B. Ingram Jr.
District 12: Charlotte up to Davidson. Key Issues: Incumbent Alma Adams is facing opposition in the primary from challengers who criticize her for not being from Charlotte. Adams faced this issue upon her reelection in 2016, when maps were redrawn that consolidated District 12 to Mecklenburg County. Prior to the re-draw, District 12 stretched from Charlotte to Greensboro, Adams’ home city, along I-85. Adams moved to Charlotte in March 2016 and voter registration records show that she is registered in Mecklenburg County. Challengers Gabe Ortiz and Patrick Register said that’s not enough. Ortiz said representatives should be “rooted in the community” that they serve. Ortiz resides in South Charlotte, which is part of District 9. Register lives in North Charlotte. Keith Young is from Asheville, North Carolina. Laws do not require legislators to live in the districts that they serve. Correction: The original article incorrectly stated who was the incumbent in the District 99 North Carolina House of Representatives race. The incumbent in that race is Rodney Moore.